Selling Holy Death – From Grim Reaper to Skeletal Virgin, A Brief Look at Commercializing an Emerging Iconography | ?! 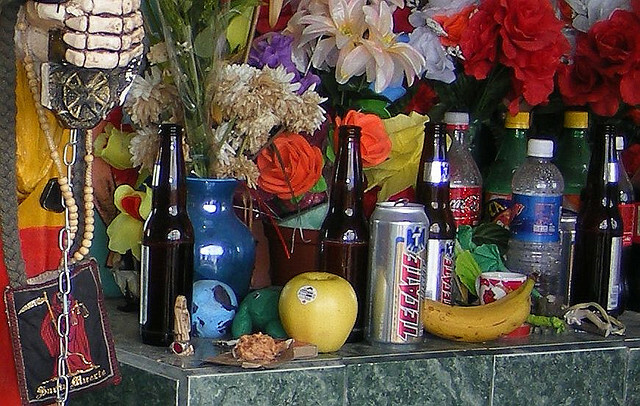 Tracking the flowering of the Santa Muerte tradition is a fascinating way to study the development of an “official” religion from the seeds of folk practice. In the United States alarmist media has spurred the interest of popular kitsch, and the images of La Madre Poderosa that have become part of the commercial aspect of Her cultus are an interesting way to engage in the changes that occur when a tradition begins to develop enough efficacy in the social domain to elicit commodification. This is a favored motif for t-shirts, where graphic artists have been popularizing fashionable versions of the Dia de los Muertos tradition for a number of years. Renaming already familiar stock images, or reworking them, to gain association with Santa Muerte is an easy commercial fix when you’ve got a fast growing market on your hands that is unaware of the roots you are tapping. 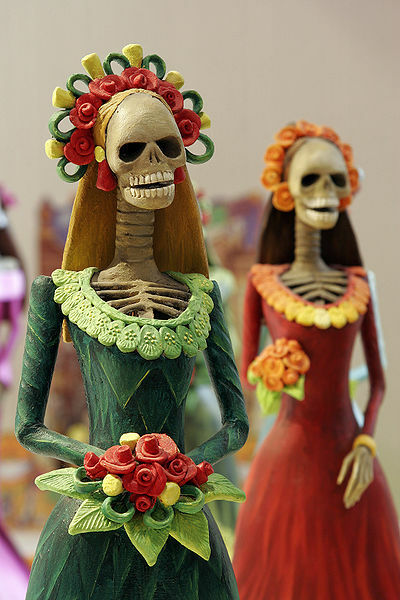 Here we also see the addition of Dia de los Muertos costuming and makeup to Santa Muerte’s assumed tradition. 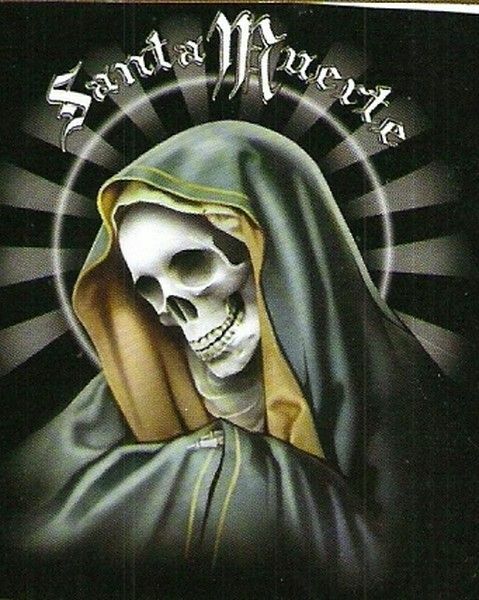 I’ve noticed a number of bloggers mention Santa Muerte’s connection to this festival, and it seems this is coming, in part, from the commercial use of this imagery on t-shirts sold in the United States under the auspices of being representations of Santa Muerte. However, this is just one small aspect of the active folk tradition associated with Santa Muerte, and may have emerged through the playful and amorphous name play that attends Her devotions more than any actual ties between the two figures. La Cavalera Catrina, or the Elegant Skull, is a character developed by the Mexican artist Jose Guadalupe Posada in the early 20th century to satirize the influence of European aristocracy on Latin American culture. With the appellations of beauty lauded on Santa Muerte from Her devotees it’s easy to see how She has taken on some associations with a figure implying wealth and elegance. We can even see this as a continuation of the social critique inherent in Posada’s original characterization. In all of this, if we are really searching for the White Flower, we have to ask ourselves if we are truly seeing the face of Holy Death that Her devotees see. Elke Weesjes, the lead editor for the United Academics magazine, asked a very pertinent question along these lines during a panel discussion on Santa Muerte hosted by the Morbid Anatomy Library. Even considering an honest commercialization born on the enthusiasm of Her followers, how doe we separate the commodified changes from the ones which actually speak to the tradition, and having said that, at what level can such a distinction between commercial and devotional be made. If we want to see Her “true” face, we need to start with precursors to Her entry into the international market, and the inevitable expansion of her product line which this entails. When we do this, we find a very different figure from the one being promoted in the U.S.
As Dr. R. Andrew Chesnut, who was featured on the Morbid Anatomy panel, points out in his book Devoted to Death: Santa Muerte, The Skeleton Saint, when we go back to the original iconography, and look at how She is represented in other parts of the Americas, we find that Her imagery draws much more from the Grim Reaper, as portrayed in 1980’s and ’90’s fantasy art, than She does any kitsch reworking of the Holy Mother to fit more saleable ideas of Santa Muerte’s nature. Coming to terms with these images, which are in stark contrast to the safer and cultivated versions appearing in the United States, we meet with a number of powerful insights into the emergence of folk practice. Here we see a pattern that goes beyond Santa Muerte’s devotional tradition and into assumptions made when facing any tradition emerging outside of cultural orthodoxy and institutionalization. This quest leads us into some odd and unexpected territory as we encounter the interstice of mass distribution and the commercialization of the cultural zeitgeist. For those saturated in the ironies of popular culture the Mountain t-shirt company has become notorious for its animal shirt designs, one of the more popular ones being three wolves poised melodramatically mid-howl against a full moon. Available at Walmart, Spencers, and many other stores catering to less discerning markets, these products have the distinction of being rather culturally radioactive, and even wearing them in jest requires a rarified self conceit to pull off. 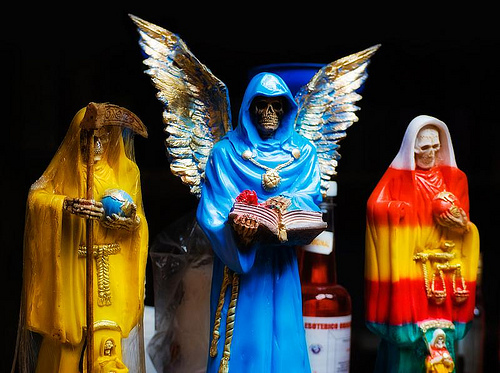 They conjure cultural stereotypes of basement dwelling gamers, or socially awkward pagans, more than a righteous representation of Holy Death’s devotions, yet it is here that we find a clue to Santa Muerte’s original commercial iconography. If you are a savvy entrepreneur in the Mexican market, looking to quickly capitalize on the growth of a popular tradition, or if you are an intent devotee looking to represent La Nina Bonita through your clothing, where would you start? There aren’t any companies making Santa Muerte specific shirts, nor does it make commercial sense that there would be, you don’t have access to a graphic design team or the proper printing facilities, you’re also limited in terms of time, money and transportation, so you grab the first thing that fits the bill within your environment. In Santa Muerte’s case this just happened to be shirts with illustrations of the Grim Reaper, and that’s where the Mountain T-Shirt company comes in. You’ll notice that these shirts have the Mountain logo on the front, and are tagged with additional brand logos near the neck, yet the Santa Muerte shirts don’t have these markings on them. The shirts related to Santa Muerte also have Her name written on them, something that would not appear on a Mountain t-shirt. Those looking for authenticity may scoff at the possibility of stores like Walmart and Spencer’s eventually carrying Santa Muerte related items, yet these iconic brands of cheap commercialization simply sell a more established, and official, version of the black market reproductions where Santa Muerte first met the marketplace. They specialize in cheap, mass produced knock offs that mirror more culturally sophisticated products and represent the success of this process for vendors selling their wares street side or at flea and craft markets. Does this negate the potency of these items in terms of the devotional tradition itself? America’s long tradition of repurposing popular brands for spiritual needs (think of Hoyt’s cologne or Florida Water within American folk magic) shows that it may have very little effect. 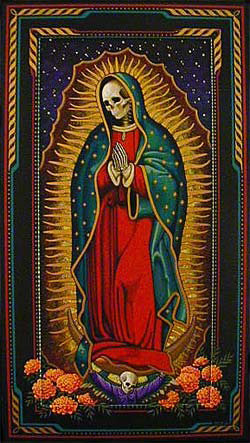 In the first place we have the necessity of illicit intervention to strip away the official logos from these images, which is then replaced with a logo for Santa Muerte. Already we are dealing with a commercial item that has increased it’s liminal efficacy through piracy. 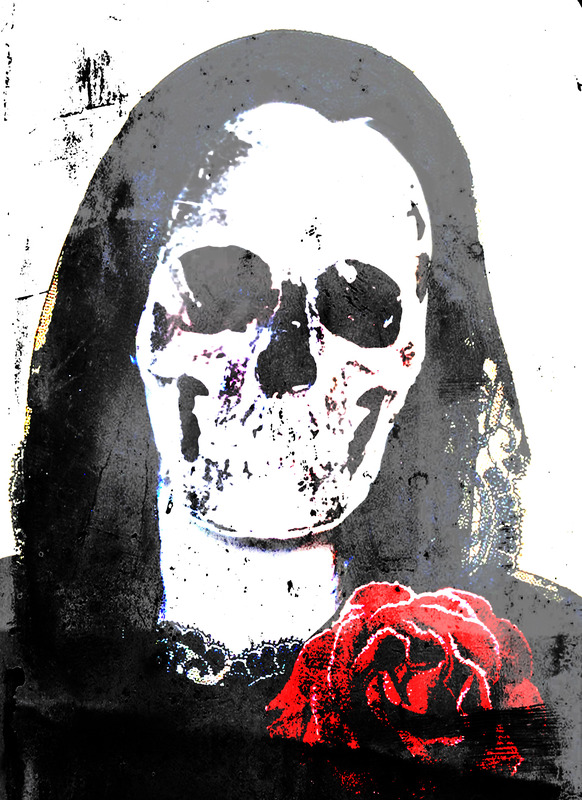 If we are to look at loss of effective value, this depletion is more apparent in the United States where Santa Muerte has been relegated to being the Virgin Mary’s dark half, or some late coming dark avatar of the Mother Goddess mythos, neither of which have a very strong footing in the foundational mythography of the United States. Here loss of potency is implicit in the misdesignation of symbolism, and in the routine familiarity of the iconography being used to represent Her to U.S. audiences. While this is an aspect of commodification, it is not the most obvious one that comes to mind when thinking about how this process affects spiritual practices. The commercialization itself has no effect on how these products interact with the spiritual tradition, it is in the symbolism used where we find the real decline. We need to consider why a devotee would want to wear a shirt with Her image on it. 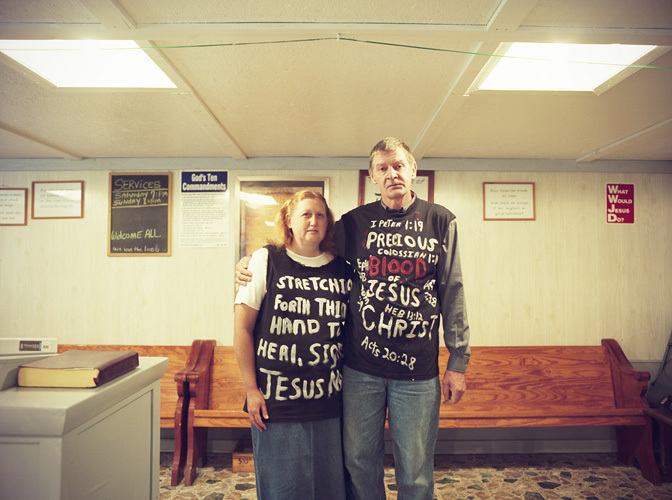 In the U.S. clothing is most often associated with class status and sub-cultural ties, but within the spiritual domain we have to begin thinking of how this relates to the public performance of faith. Again, there are parallels here in terms of the public performance of class and sub-culture, however they become subtly different when we begin thinking of this in terms of spiritual practice where symbolism has an added level of proposed power over effecting change in the world. For a worldview that includes concepts of spiritual warfare, and what scholars would suggest is a form of magic more than religion, a properly anointed shirt becomes a symbolic talisman. How far this goes is up to the individual practitioner. It is the same process through which a relic gains spiritual power through direct association with a sanctified persona, only here we find it operating within a looser framework for beatification. Returning to Santa Muerte, if you think of all of the oils, baths, perfumes, colognes and incense that are sold to increase the effect of petitionary prayer, and add this to concepts of ritualism inherent in folk Catholicism you begin to get an idea of how even a commercial product could quickly become an active talisman. Meditating on Her influence as a patron of the dispossessed, and considering what this means in terms of hijacking the false authority of rigid orthodoxy, we can find Her actively at hand in the illegal reproduction of branded imagery, and in the confusion faced by those in the United States seeking an established iconography for the Saint. There is also the ambient fact that the original Mountain shirts bear a cultural stigma which puts them firmly in Her domain. Marketing Her to U.S. sub-cultures we can see how brands are aiding Her silent entry into the mainstream behind safer imagery. Because they need to focus on trends, company’s capitalizing on Santa Muerte need to make Her imagery more inline with already accepted, and profitable, items. Here She has access to areas of culture that would shut the doors on Her more open influence. One can imagine that any kid who bought an “Emo” Santa Muerte shirt wouldn’t find their stay in the barrios of Mexico City very pleasant. Those fostering the heart of the tradition, and providing the real belief and activity that fuels its expression and growth, exist in a world that would be very disturbing to suburban and commercial interests. There is an amazing alchemical aspect to this whole process where the prima materia of cultural detritus propagated by businesses like Walmart and Spencers is transmuted into an iconography whose cult status has drawn the official ire of representative orthodoxies at all levels of society. What looks like cheesy fantasy art to the carefully mediated eye of U.S. sophisticates provides the imaginal infrastructure for a movement that has been drawing increasing concern from the military and law enforcement establishment since at least 2005. While erstwhile devotees in the U.S. are sporting a weakened strain of Santa Muerte’s iconography, the swirling matrix of global capitalism continues to support and cultivate the black market distribution networks where more virulent representations of the faith are fostered. So if you are looking at picking up a Santa Muerte t-shirt, you’ll be better served heading to a local flea market or digging through Ebay listings for Grim Reaper shirts than buying something with more official branding, and you should also make sure to pick up the additional spiritual ephemera you’ll need to give it a proper anointing. Or better yet, repurpose Rev. Lusance’s advice and make your own, a t-shirt which will be a true flowering of your interest in the shadowy devotions of this misunderstood saint. Whether She is seen in the form of a skeletal virgin or a wrathful reaper, She is always outside of the established norm. Commercial interests, cultural commoditization, and orthodox critique all meet with the same negation in Her empty eyes. Black or white market materials make no difference to She who rules the Most Holy domain of death, Her only interest is in the Blood and the Life. 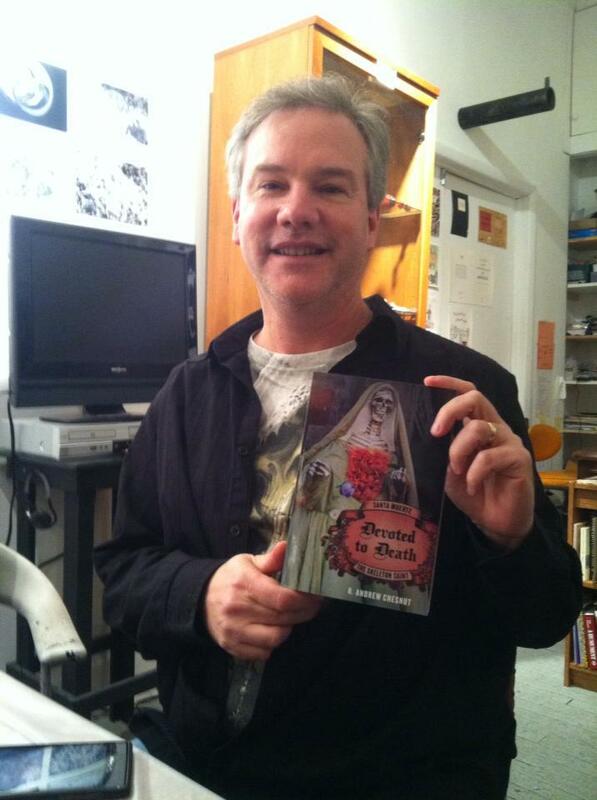 Note: Special thanks to Dr. R. Andrew Chesnut who wore a very striking Santa Muerte shirt he received from Dona Queta to the Morbid Anatomy event, helping to foster my curiosity in regard to the commercialization of the Santa Muerte tradition. This entry was posted in Mytho-Poesis and tagged Andrew Chesnut, Devoted to Death, Mountain T-Shirts, Santa Muerte, Spirituality, T-Shirt. Bookmark the permalink. Excellent piece, David – and a timely reminder for me to read Chesnut! I’d query whether commercialization of the image is necessarily a dilution, rather than a memetic adaptation for the belief to spread. Such things evolve, of course – the question becomes one of variation rather than dilution, perhaps? As ever, the blurry boundary between objects of praxis and pop-culture fascinates me. 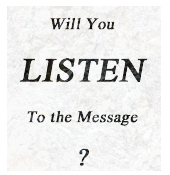 Did you ever get to read Any Adam Possamai on hyper-real religion? 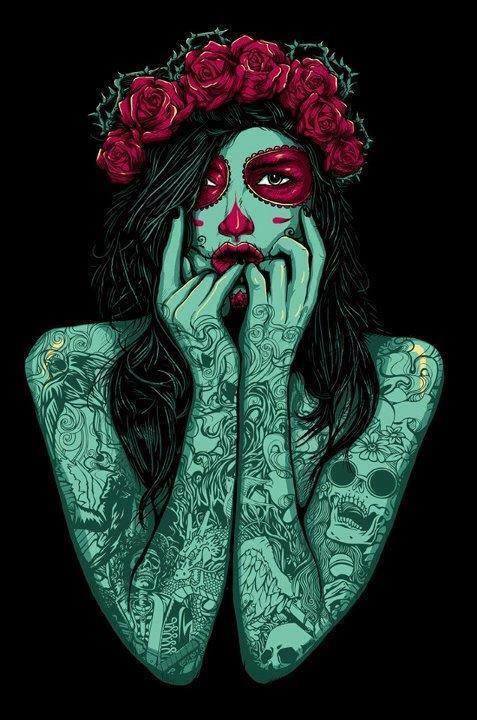 I would agree re: variation, in the process of researching and writing on this I’ve sort of drifted through a number of responses, settling in at the fact that Santa Muerte is really too potent a Mystery for the commercialization of the image to damage it. Also there is the fact that when the iconography is based on the grim reaper fantasy art, the art exists separately form the association with Her, and so there’s an interesting interplay between the “Spirit” of Her devotion entering into already cultured forms. This evening I checked to see if Walmart actually sold shirts that had these specific grim reaper motifs, and when I found they did, I was actually happy to see that She is able to access that space as well. I haven’t read Adam Possamai, thanks for the recommendation! I’ll have to check out his writing. Hello. I got this link from Sarah’s Invocatio blog where she comes out with her weekly best pics, and am going to reblog it to mine, so thank you. Blessings. 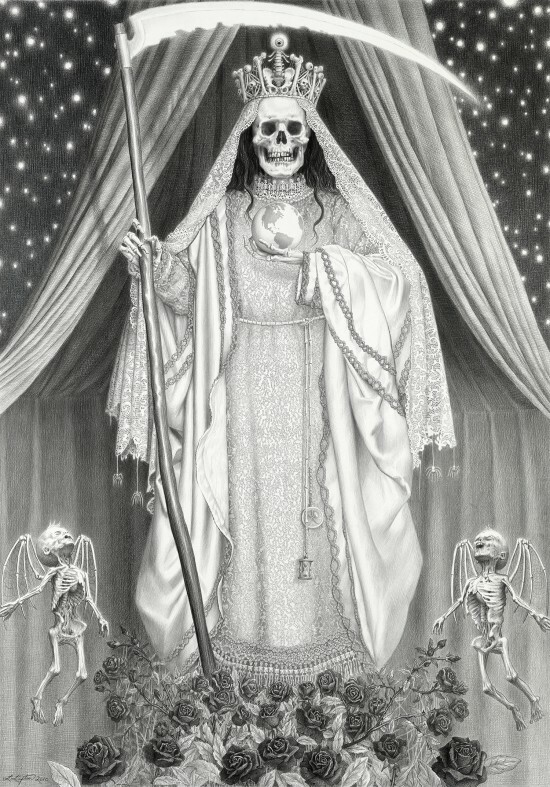 I found this interesting article on Santa Muerte referred to from Sarah Veale’s Invocatio blog, which comes out about once a week with lots of great articles from various blogs. I also liked Nick Farrell’s post on choosing magickal groups. Enjoy!